Leaves for Trees: What are your thoughts on cemetery behavior? This past weekend I was reading through the online version of the Kansas City Star and came across a Dear Abby column where the writer lamented the behavior of children at cemeteries. In short, the author was disturbed by parents that allowed their children to use a cemetery as a playground. I was also disturbed by the thought of children running through a cemetery, pulling up flowers and taking the mementos left on the headstones as their own treasures. That is clearly a parenting issue. But the more I thought about it, the more I began to think that Americans seem to have a very "Victorian" idea of death. It's something we don't talk about and we haven't changed our ideas on death in a very long time. The author made me feel as if I must walk through a cemetery as if I were part of a constant death march. Please don't misunderstand, I firmly believe that a cemetery should be a place of reflection and respect for those that have passed before us. And I don't believe that children should be climbing on headstones or "treasure hunting" among mementos. But I also don't believe that myself or my children must remain quiet as a tomb as we explore cemeteries. Unless, of course, there were a funeral taking place. But in that instance I would wait to explore the cemetery at another time. My little one leaves a treasure for his 3rd great grandparents. I take my children with me to cemeteries because I often don't have a choice. But I also believe that they must understand what death means. And they also need to be exposed to cemeteries so that they can be taught the proper way to behave. If it is a beautiful day and my son feels like skipping through the grass while we hunt for an ancestor, I don't have an issue with that. After all, life goes on, and I think this simple type of act is the embodiment of that. What do you think? While I wouldn't allow my children to walk on tombstones or take treasures from the cemetery, I think it's fine for them to laugh, talk and use good behavior as they would anywhere else. If someone happened to visiting a grave while we were there, I'd move to another area of the cemetery out of respect. I think it's a good idea to expose children to a variety of experiences so they can learn how to behave in various situations. Personally, I think those that have gone on would be pleased to know their young descendants come to visit their graves and remember them. It would be helpful to show the kids a picture of an ancestor beforehand so they can make the connection when you visit the cemetery. I agree. Sounds like we are on the same page on this one. I agree with you Heather. We as a culture tend to forget that cemeteries are actually for the living as well as the dead; otherwise why would we even have them. We encourage people to visit cemeteries and there was a movement some time ago to make cemeteries into parks and arboretums -- as attractive, bucolic places to visit. Folks used to even picnic at cemeteries when visiting their ancestors and relatives! Places to be respectful and circumspect? Yes, of course. Places to be treated as silent zones where the living are intruders? Absolutely not! John, you bring up a good point. People did used to make visiting the cemetery an "outing." I would enjoy that, heck, maybe I'll try to bring it back! Most of the cemeteries my relatives are buried in are beautiful and we have to remember that they are designed that way not for the dead, but for the living. We should enjoy them! Thank you so much for the award Kassie! 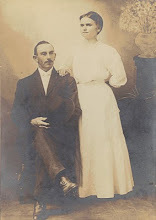 I just wanted to let you know that this post is listed in today's Fab Finds post at http://janasgenealogyandfamilyhistory.blogspot.com/2013/02/follow-fridayfab-finds-for-february-22.html. Our local cemeteries sponsor tours, bird watching days, and even theatrical nights with actors telling the stories of the "residents" buried there. I just heard that one cemetery in another part of the country cancelled their theatrical night after complaints that it was "inappropriate". I was absolutely shocked at that turn of events. What do you think of these uses of cemeteries? Thank you, Jana for the mention! Heather, I think those are great uses of a cemetery! How better to let our ancestors be remembered than to have a theatrical night? Besides, cemeteries take up a lot of beautiful land, especially in large cities. If we didn't use them for things other than burial, aren't we wasting beautiful spaces? I agree with you- completely. I never visited a cemetery until I began my family research at the age of 18. Not so for my grands- my oldest has been my findagrave helper since the age of 5. Heather KR and Heather WR -- I had not heard of the uses of cemeteries Heather Rojo mentions, but I think they are great ideas, especially the theatrical presentations about the lives of those reposing in the cemetery! Such presentations are in keeping with my firm belief that "Immortality lies in being remembered by your family and friends!" Theatrical presentations on lives to be remember is "inappropriate?" Just the opposite IMHO! I too have taken my children along with me to cemeteries. They are well behaved when we go. I've explained to them what it means. My almost 8 year old says that we've put people in the ground and their spirit's are now in heaven. She asks good questions when we are visiting a cemetery. My kids know that are not allowed to run around but can be chipper and talk while we are there.